An extraordinary cluster of faraway galaxies is shattering or challenging a number of cosmic records, weighing in as potentially the most massive cluster known. The colossal galaxy cluster is also the brightest in X-ray light, and the galaxy at its heart apparently gives birth to more than 700 stars per year – hundreds of times as fast as our Milky Way forms stars, researchers say. The cluster of galaxies, located about 7 billion light-years away, is formally known by the alphabet-soup name of SPT-CLJ2344-4243. Astronomers also have given it a more informal moniker: the Phoenix cluster, named after the constellation in which it resides. It appears to contain thousands of galaxies with a range of sizes, from dwarf galaxies to conglomerations of stars about the size of the Milky Way. "I would say it's in a dead heat for the most massive galaxy cluster," study lead author Michael McDonald, an astronomer at the Massachusetts Institute of Technology, told SPACE.com. "The record holder, 'El Gordo,' is slightly more massive, but the uncertainty in this estimate is high — it could turn out that with more careful measurements, Phoenix is more massive." The Phoenix cluster was initially discovered in 2010 by the South Pole Telescope. "We didn't realize how exciting it was until summer of 2011, when we obtained follow-up X-ray data from the Chandra X-ray Observatory," McDonald said. "These observations immediately revealed the extreme X-ray brightness of this galaxy cluster." "My first thought was that if there's that much cooling going on, there should be stars forming," McDonald said. 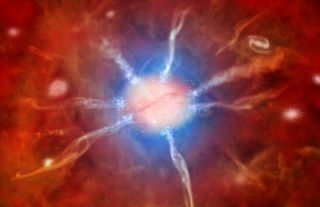 As such, using the Gemini telescope, "we found evidence for a tremendous amount of star formation." Researchers say the central galaxy in the Phoenix cluster is apparently forming a whopping 740 stars per year, based on images acquired from 10 different telescopes in space and on the ground around the world that observed the cluster at a variety of wavelengths. The previous record holder was Abell1835, a galaxy that forms about 100 stars per year. "If you look at normal galaxy clusters, the central, most massive galaxy is typically forming stars at a rate of one new star every few years," McDonald said. "It's a huge difference." The central massive galaxies are essentially the first to form within such clusters. Being billions of years old, they are expected to have been dormant a very long time. That makes this "starburst" activity seen in the Phoenix cluster's central galaxy even more extraordinary. "Central galaxies have typically been referred to as 'red and dead' — just a bunch of old stars orbiting a massive black hole, and there's nothing new happening," McDonald said. "But the central galaxy in this cluster has somehow come to life and is giving birth to prodigious numbers of new stars." One explanation for this "cooling flow problem" may be that a cluster's natural cooling somehow gets interrupted. For instance, the supermassive black holes suspected to lurk at the centers of many of these clusters might emit jets of particles that reheat the core, preventing it from cooling entirely. "What's interesting about the Phoenix cluster is that we see such a large fraction of the cooling that was predicted," McDonald said. "It could be that this is earlier in the evolution where there's nothing stopping it, so it cools and becomes a starburst." In the future, "ideally we'd like to find more systems like this," McDonald said. "It's really difficult to draw meaningful conclusions based on a single system. "If we could find more systems like this one, it would imply that this is a normal phase of galaxy cluster evolution," he added. "To do this, we need deeper surveys that cover larger areas of the sky. We have the technology in place for this — we just need time and continued financial support." On the other hand, the Phoenix cluster may prove unique. If so, "we hope to get more detailed observations to answer questions such as, 'Why isn't the central black hole regulating this extreme cooling and the resulting star formation?' and, 'Is the starburst really being fueled by the cooling gas in the cluster core, or is it the result of something more exotic, like galaxy-galaxy mergers?'" McDonald said. The team's findings are detailed in the Aug. 16 issue of the journal Nature.